Former PHS member Mervyn Edwards (you may remember his “meet the member” biography in the Summer 2009 Newsletter where he is depicted dressed as a bottle of beer!) 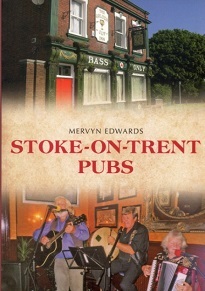 has written about pubs in his neck of the woods before (Newcastle-under-Lyme and environs) but here he concentrates on Stoke-on-Trent. It is clear that the author has been busy in his research; he has obviously had recourse to examine newspaper files, court records, directories, published books and individual collections of papers, not to mention interviewing living pub workers. This rounded approach has the benefit of filling out the stories of each pub, though we are not overburdened with detail, which fits in with the premise of this kind of book which I believe is to entertain as well as to educate. Although the fabric of the individual pub buildings and their evolution over time is addressed the focus is on the people that have worked and drunk in them (quite rightly). Thus we learn of the public house’s place in the lives of ordinary people, and how they loved their games; it seems that the Potteries was a hot bed of skittles in the late 1890s and up to the First World War; though bowls, billiards and even bear-baiting also get a mention (though curiously the game of darts is hardly alluded to). Because we are privy here to court proceedings with reference to individuals in pubs there is a danger that one might gain the impression that the nineteenth century was a brutish time where drunken altercations in pubs were frequent occurrences, where this is probably not true. Nonetheless one can’t deny that occasionally murders did take place on licensed premises. Overall though the pub emerges as a place of refuge and sociability even up to modern times. Pictorially the emphasis is on more recent history, indeed there is a scarcity of photographs from earlier than the 1990s which is a serious weakness of the book. Though it is to be commended that recent history is not overlooked (Mervyn himself appears, pictured standing on a stool in The Coachmakers’ Arms in Hanley in period costume addressing an assembly of the Sandbach Round Table), surely there are sufficient older images extant that could have been used to show how pubs, the people that ran them and their customers looked in bygone days. That aside, the book is a good read with a few gems exhumed from the archives; I particularly enjoyed the description of two colliers misbehaving in The Robin Hood pub at Norton from a newspaper report of 1845 who were said to be “disguised in drink”. Or again the later story, from 1949 where it was reported that a Fenton man, having been caught accessing the till at The Norton Arms, explained to the court that he thought the cash register was a musical instrument and was expecting to hear a note as he depressed the key. Fined £5. Worth a try. I am at a loss to explain why there is no index to the book, rather frustrating.